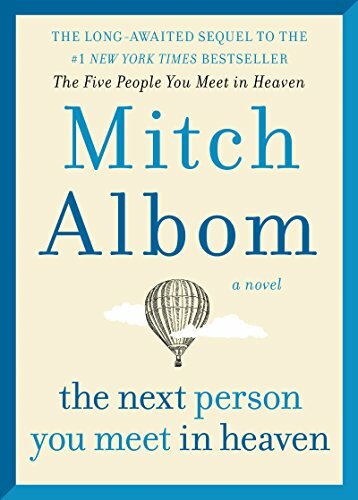 In this sequel to The Five People You Meet in Heaven, Eddie, the amusement park mechanic appears to Annie as a guide in heaven. Annie, who has just married her love Paolo, is enjoying a hot-air balloon ride with him when a horrific accident occurs. The tale transitions between Annie's current life and her past. As a child, she is raised by a loving mother and an angry, abusive father. When abuse turns toward her, Annie's mom, Lorraine throws her husband out to become a single parent. But loneliness hits hard, and Lorraine takes up with a series of boyfriends, all who make Annie feel isolated. At age eight, Annie goes to a theme park with Lorraine and one of her mother's paramours. Left on her own a ride she’s on crashes, severing Annie's hand. However, she is saved from a certain death by Eddie who succumbed to the disaster. This is the turning point for Lorraine. The doctors are able to reattach Annie's arm, and after surgery and therapy, Lorraine moves them to Arizona for a fresh start. Lorraine more or less holds Annie hostage in their trailer while she works. Bored and sad, Annie has no friends and nothing to do. She pleads to attend school but upon going is besieged with torments and bullying by her classmates. The only one who shows interest in her is Paolo. He never makes fun of her and they are friends until his family moves when he is 14. Then again, she is alone. Reminiscing about her life, Annie recalls times when she believed she made mistakes. She wonders why she survived the accident and what her purpose is in living. She becomes estranged from Lorraine after high school and goes astray. Years later, she reunites with Paulo, her only love, and they marry. After their wedding, they stop to help a man with a flat tire and learn he owns a hot-air balloon service, so Annie begs Paulo to go on a ride. Disaster strikes when they hit an electric line and the balloon explodes and crashes and they are rushed to the hospital. When Annie learns Paulo needs a lung she offers one of hers even though she’s wounded. "'Is this really heaven,'" she asked, "'why are you the person greeting me? Aren't I supposed to see God? Or Jesus? Or at least someone I remember?'" "'That comes in time,'" Sameer said. "'But the five people you meet first are chosen for a reason. They affected you in some way on earth. Maybe you knew them. Maybe you didn't.'" This is the first to take her on this unusual journey. The second appears in the form of an old woman yet is the spirit of Annie's beloved childhood dog, Cleo. "Annie asks: "'Why are you—'"
"'Loneliness, Annie. That's what I am here to explain. You suffered it. You tortured yourself over it. But you never understood it.'" Next Annie encounters her mother, who has passed earlier due to cancer. They have a heart-to-heart, and Lorraine explains her actions toward Annie. "'Mistakes,'" Eddie declared. "'That's what I'm her to teach you about. You felt like you kept making them? You feel like maybe you made one now?'" "'I used to think the same thing,'" Eddie continued. '"I thought my whole life was a mistake. Things kept happening to me, lousy things, until I finally gave up trying.'" "Love comes when you least expect it. Love comes when you most need it. Love comes when you are ready to receive it or can no longer deny it. These are common expressions that hold varying truths of love. But the truth of love for Annie was that, for a long time, nearly ten years, she expected none and got none in return." The novel offers a profound and eye-opening look into what could be heaven. Flashbacks into Annie's life help to clarify things that could occur in anyone's life. It alleviates the fear of death, showing that no matter what mistakes one feels one’s made, there is redemption along with peace and the reality that everyone's life has purpose and meaning.